Ask any orthopedic surgeon in India about an interesting trend in the demography of his/her patients and you will not be surprised to hear them cite a significant increase in their number of patients complaining of tennis elbow, stiff necks, or frozen shoulders, especially those who spend endless hours on their desks in front of their computers. This World Health Day, we share a powerful 7 minute solution for that stiff neck, hardened shoulder muscle and tired eyes and fingers that crackle from overusing the keypads. You can do this anywhere, at home or office, individually or in a group! There are days when you want to pull your hair out, mince your teeth, and tighten your fists and yell. Well, we say, breathe in, tighten your fists, tighten your whole body, squeeze your stomach in, frown, and purse your lips together… And now, let go with a ‘haa’ sound. This is one of many Sukshma Yoga techniques (light warm up asanas that bring deep and sustainable relief). They are simple to do and you can do them anywhere! And in just under 7 minutes, you can feel the difference in the state of your mind and body. You will feel mentally relaxed, light and less stiffness in the body. Sukshma Yoga is especially beneficial if you have a desk job, where your neck and back muscles are constantly burdened from slouching and looking at the screen. Sukshma Yoga takes no time or preparation. These little exercises open up subtle energy channels and in a session as short as 7 minutes, you can feel a palpable difference. Hold the sides of your head gently and with awareness. Then gently massage your head and scalp. It facilitates blood circulation to the brain. Pinch your eyebrows 5 to 6 times using your thumb and index finger. Roll your eyes 5 to 6 times clockwise and then anticlockwise. Squeeze your eyes tight and then open them wide. Repeat this 10 to 15 times. Pull your earlobes downwards and hold for 10 to 15 seconds.Scientists say that all the nerves that increase pragya (awareness) are located in the lower part of the ear. Pulling your ears increases awareness and reduces the chances of making mistakes. 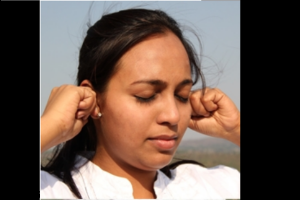 Hold your ears and move them in a clockwise and then anticlockwise direction till your ears become hot. 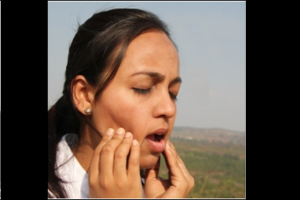 Massage your jaws and cheek by moving the three fingers (first, middle, and ring finger) from the jawline to the chin. You may keep your mouth open as you do this. Did you find knots in the spaces between your jaws? These knots indicate the physical stress. Open and close your jaws 8 to 10 times. Open your mouth and move your jaws from side to side 8 to 10 times. Rotate your neck. Breathing in, take your head back and breathing out, touch your chin to your chest. Repeat this 5 to 6 times. Rotate your head, first in a clockwise direction, then in an anticlockwise direction. Breathe in as you go up (first half of the cycle) and breathe out as you return to the starting position (second half of the cycle). Repeat this 5 to 6 times in a clockwise direction. Then switch to an anticlockwise direction. Now shake your hands vigorously for 2 minutes. Then slowly bring them to a halt and sit still. To get the full benefit of Sukshma Yoga, what is really uncompromisingly important is to do each posture and exercise with totally awareness, alignment with breath and practicing it with honor is important, because each little movement or activity releases some amount of stress and you can slowly start feeling the difference in prana or life force after regular practice. It can also be a great bonding routine for your team every afternoon before breaking for lunch! In the 8 hour work day, it is nearly impossible to sustain your attention for nearly the same number of hours. So, wouldn’t it be great if you could scrunch in some peace time for a 20 minute meditation in the afternoon before meals, to put a break on the whirring thoughts and all the hyperactivity in your mind, and make a fresh start for a more productive second half of your day ? 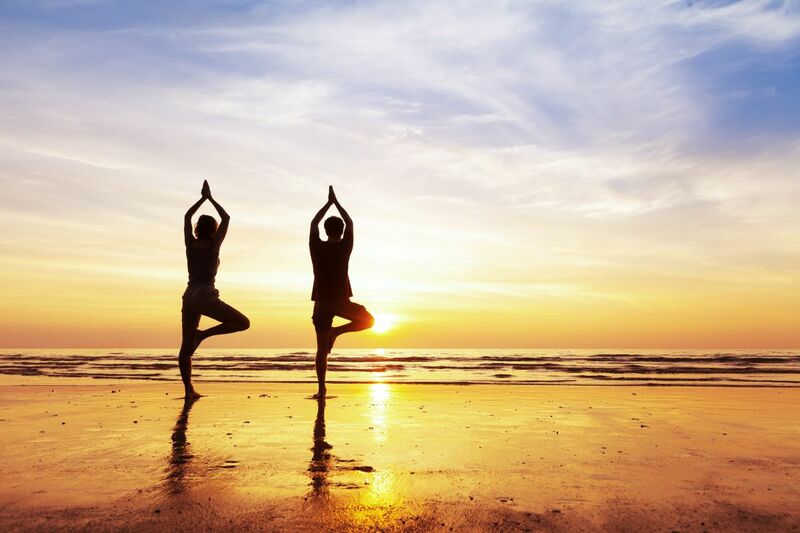 Yoga practice helps develop the body and mind bringing a lot of health benefits yet is not a substitute for medicine. It is important to learn and practice yoga postures under the supervision of a trained Sri Sri Yoga teacher.